Nora owns a 25 ft. sloop of the Eastwind type, built at Mahone Bay, Nova Scotia in 1968 by the Pace Company. 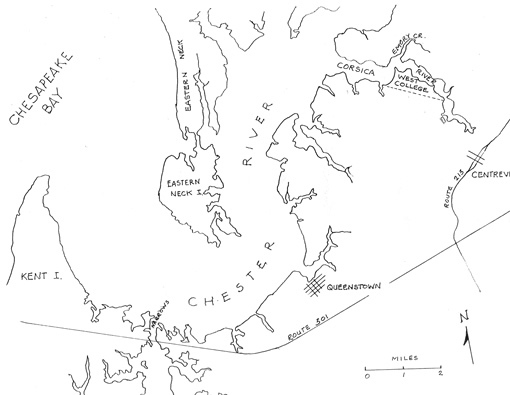 The transom carries the name DUET, with Centreville, MD as the home port. 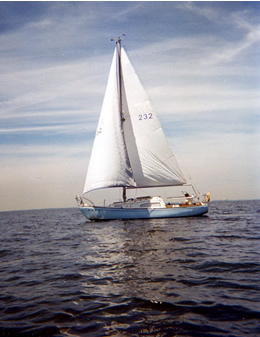 The sloop is of fiberglass construction with a full hourglass keel. She draws 3 ft. 9 in. and is powered by a Universal Atomic four engine. The hull is of royal blue with a black boot top. The topsides are white. The exterior trim is of teak. The spars are aluminum with stainless steel standing rigging. She flies one of three foresails: a jib, a 170 multiple purpose sail for light air, and a 130 self-furling genoa. The sheets are of cotton. She is steered with a tiller. The bow and stern are fitted with stainless steel pulpits connected fore and aft by cable lifelines. A swim ladder can be lowered off the stern. The starboard cockpit locker contains a fresh water storage tank and a fire extinguisher. The port locker contains the fuel tank, mooring lines, storage for a charcoal grill, bumpers, and a boat hook. The lazarette contains cleaning supplies, a bucket, a sea and storm anchor, and six life jackets. On the starboard side of the cockpit is located a control panel with engine ignition, switches for the bilge blower and bilge pump, and gauges for oil pressure, engine temperature, and battery charge. On the port side is the gearshift and the throttle. Mounted on the aft end of the cabin on the port side is a knot meter and a fathometer. A compass is mounted on the starboard side. The cabin sole is covered with a medium blue carpet. All interior woodwork is of mahogany. There are single bunks on each side of the cabin used both for sleeping and as seats. The cabin trunk has a large fixed port on each side covered by drawn curtains. Below the fixed ports are storage cabinets that run the length of the cabin. Below the bunks are additional storage spaces gained through glory holes. 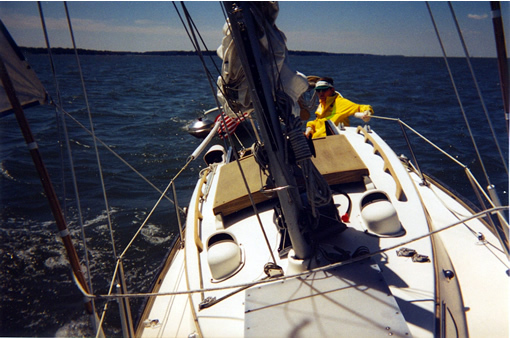 At the aft end of the cabin on the starboard side is a working surface and a two-burner non-pressurized alcohol stove. Nearby cabinets contain eating and cooking ware. On the port side is a working surface and a small sink. Behind the sink are stored plates, bowls, cups, and glasses. Amidship, just above the top step of the companionway ladder is an ice box. A plastic container beneath the stove serves as a pantry. Dry goods are stored beneath the sink. At forward end of the cabin is a bulkhead with a latched door. When it is closed, a table can be lowered into the cabin for eating or for writing. When the table is down, a rack is revealed that holds charts and other materials pertaining to navigation. Navigational instruments are located in the cabin on the starboard side of this bulkhead. Going forward through the door one comes upon the ship’s head on the port side, behind which is a glory hole for the storage of paper goods, and a shelf for first-aid materials. Opposite is a hanging locker for foul weather gear, pots and pans, anchor light, search light, and various bug repellents. This area is separated from the V-berth by another bulkhead with a latched door. The V-berth has two fixed ports covered with curtains and an overhead hatch. On each side of the V-berth there run cotton hammocks for storage of linens. Under the V-berth is a large storage area. The chain locker is located forward of the V-berth. It contains 200 ft. of half-inch braided nylon rode.